1.Our engineers team are committed to work out creative & quality-solution product. 2.Our sales team are committed to provide the best customer service and collect all the product and shopping feedback. Solution 1:The charger is built with updated connection and strong magnetic charging port, which the watch won't fall off or connect well with the charger. Solution 2: The charge is designed at a weighted stand, won't fall off easily from desk or nightstand, non-slip feature which won't stuck with one position and leave residue. Solution 3: The charger has a outstanding and noble appearance, is a highly recommended gift for your friends and family. We welcome any feedback on products and shopping experience, pls kindly contact our support email address or click here: https://www.amazon.com/ss/help/contact/?marketplaceID=ATVPDKIKX0DER&sellerID=A2PVPTFMCOC8NM& for trouble shouting-out. We provide lifetime warranty, covers all the cost during replacement. Case Unavailable: Unavailable to put on a protect case when charging. [Lifetime Warranty] Contact our support at the first time once you get a defective item, EPULY covers all the cost during the replacement or refund; All products have been checked one by one before sending to Amazon warehouse, please rest assured and enjoy shopping. 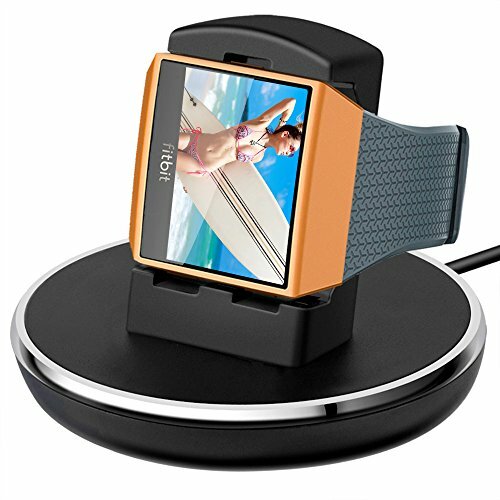 [Package Included] Epuly 1 X Fitbit ionic charger (smart watch & wall adapter not Included); 1 X Warranty Card; Only work for Ionic, not for fitbit fitness tracker. [Updated Magnet] Our engineers & sales work together to find the solution of weak magnet/connection, and Epuly fitbit charger is built in updated and strong magnet charging port. [Premium Quality] Made of durable pc material with a weighted and non-slip base(no stuck to one position, no residue left), supporting Fitbit Ionic Fitness Tracker at a stable stand and comfortable viewing angle. [Highly Recommend] We highly recommend this item to you, your friends and family, cause we have kept them for a while, one at office, one at home. If you have any questions about this product by Epuly, contact us by completing and submitting the form below. If you are looking for a specif part number, please include it with your message.